The Home Guard, for anybody under the age of sixty in 2004, will only be known by reputation, and its humorous depiction in 'Dad's Army', the classic TV comedy series which for many years has been immensely popular. However, when the Home Guard, or 'The Local Defence Volunteers' as it was first known, was formed, it was a deadly serious matter. Great Britain and the British Empire, as it was then, was fighting for its very existence, against Hitler and the Third Reich, a much better prepared and powerful foe, Of course none of the ordinary people of our Islands thought that defeat was possible, but everybody knew that we had a fight on our hands, and an attempt at invasion was always a possibility. With conscription taking most of the younger men, inevitably older men, and the younger ones who were in the vital 'reserved occupations' were needed to supplement the armed forces in home defence duties. The response to their Nation's call was immediate. A quarter of a million men of all ages volunteered within twenty four hours of the announcement. Eventually, the Home Guard, as it was renamed by Churchill, was to increase to 1.7million men. Ironically, the Governments principle motivation behind forming the force was the fear of airborne invasion. It emerged after the war that this threat had never really existed. They were trained first to a basic level, and then further depending on the tasks they carried out. These were very varied. Some were equestrian units ,carrying out patrols on horseback. Others manned anti aircraft gun batteries and, then carried out all manner of duties essential to our defence. They carried out their normal jobs during the day, and then when they were finished, they reported for Home Guard duties. They were never paid for their work, although after a while they were able to recover out of pocket expenses. Many had seen action in the Great War, and their experience was invaluable. However, senior rank in the Great War did not automatically ensure senior status in the second World War. One World War General served as an NCO! In recent years, it has emerged that some of the younger ones were secretly trained in guerilla warfare, in the event of the unthinkable happening-Britain being invaded. In Winsham the main duty of the Home Guard was to defend and protect the the bridges over the railway at Ammerham and Bridge. The units were housed in adjacent huts. 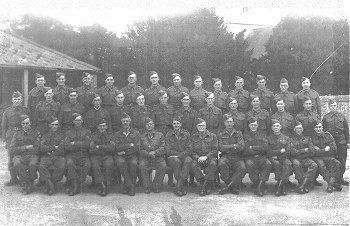 Winsham Web Museum is seeking information about the men of Winsham Home Guard, and the duties they performed. Should you have any information or photographs that could be used in this section of the Web Museum, please click here for e-mail link.